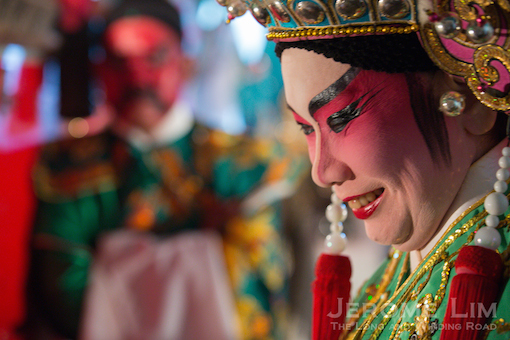 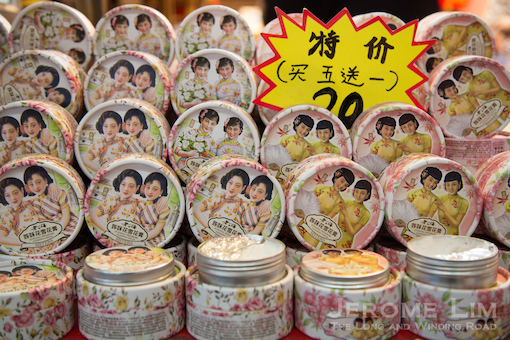 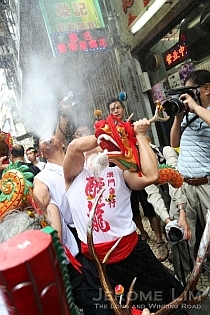 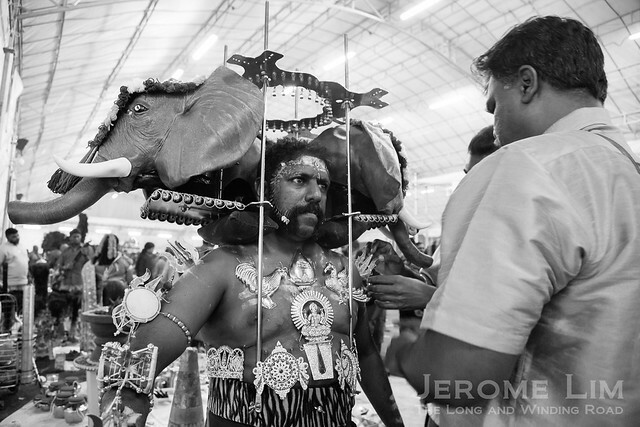 With a greater proportion of folks in Chinatown preoccupied its dressing-up for the Chinese New Year on Sunday, a deeply-rooted Singaporean tradition that took place in the same neighbourhood, “Chetty Pusam”, seemed to have gone on almost unnoticed. 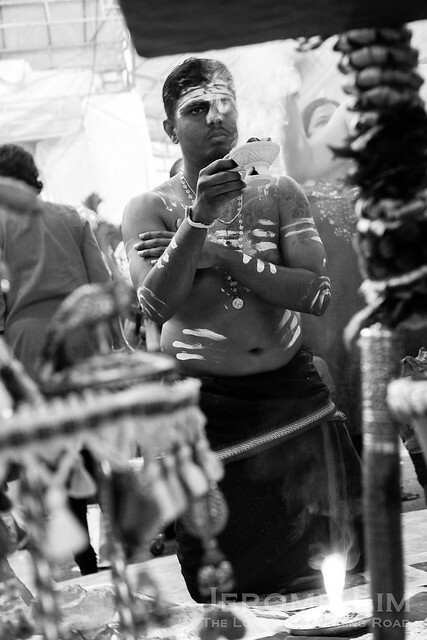 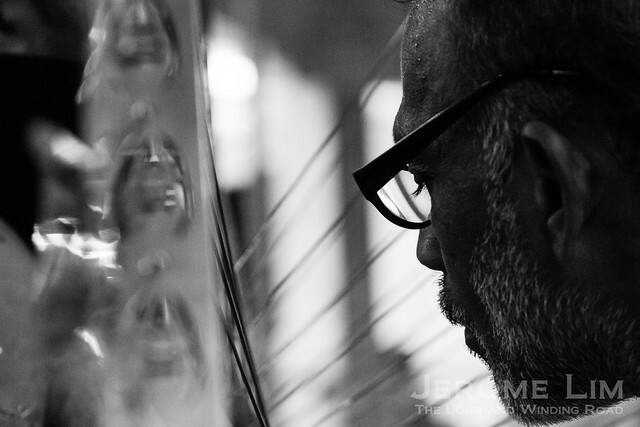 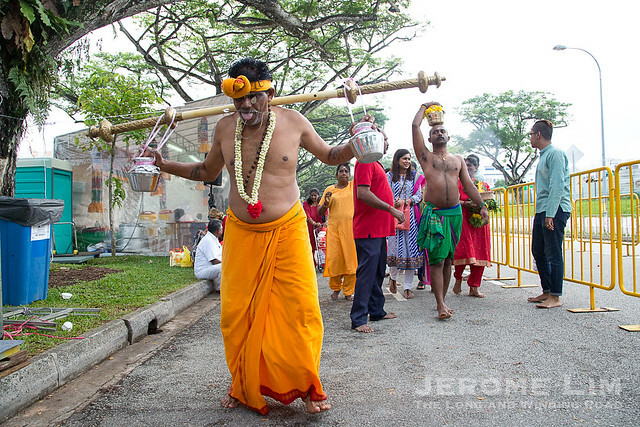 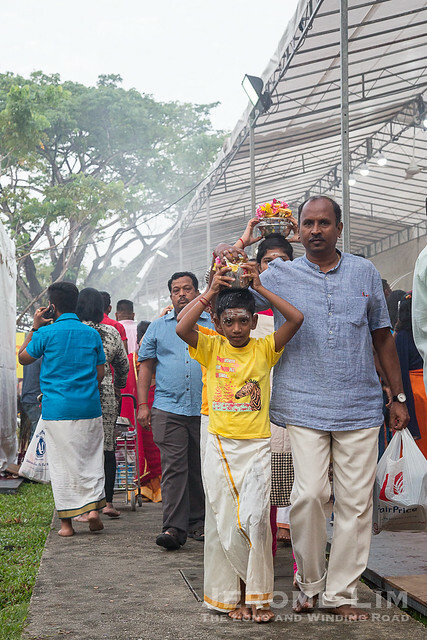 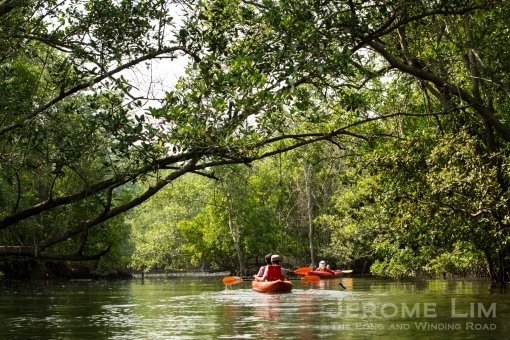 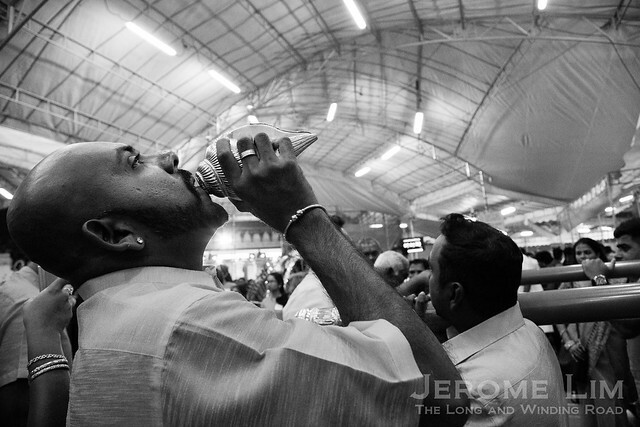 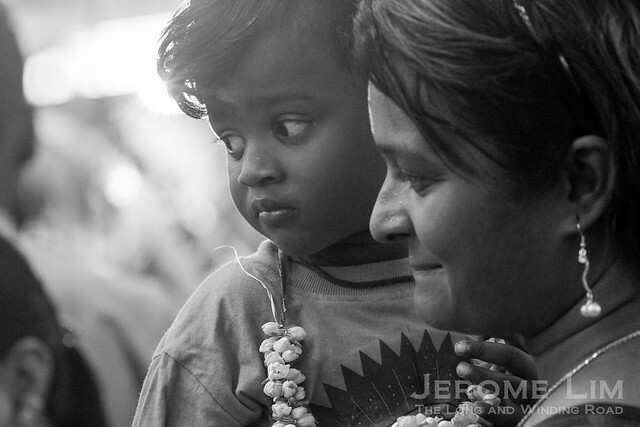 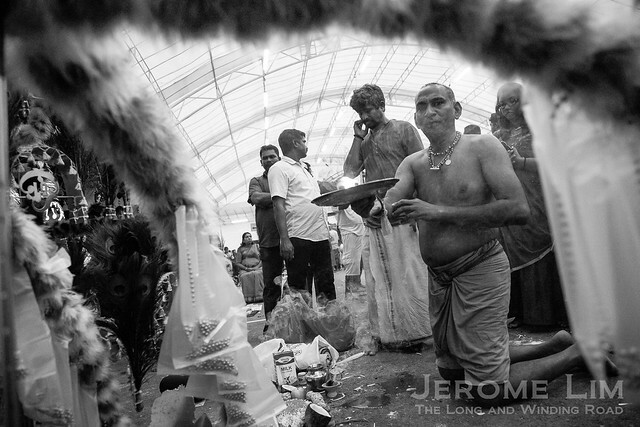 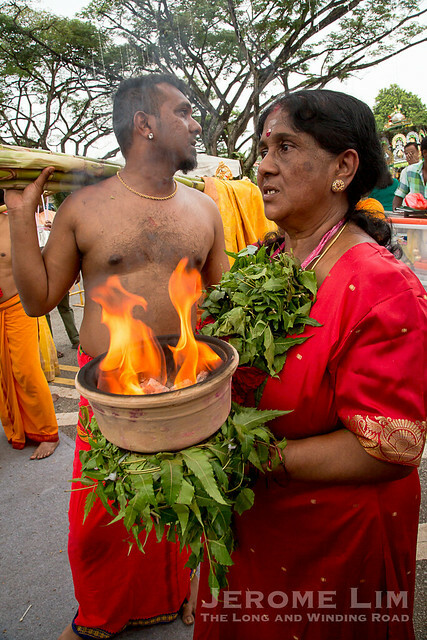 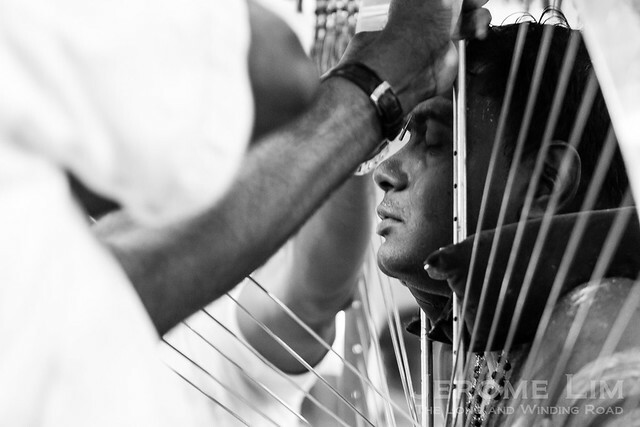 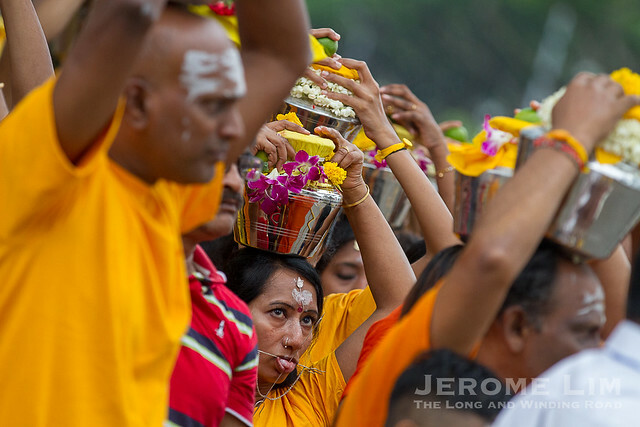 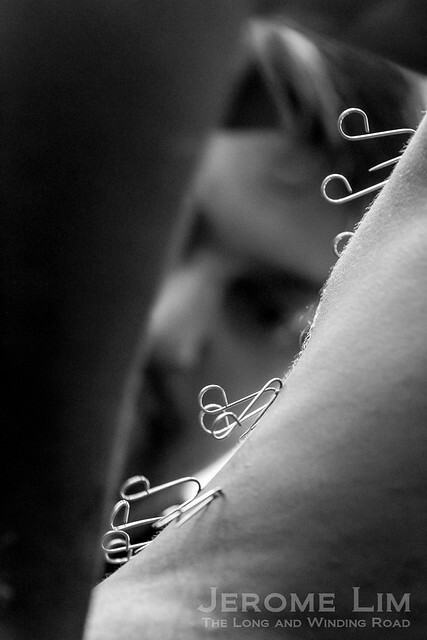 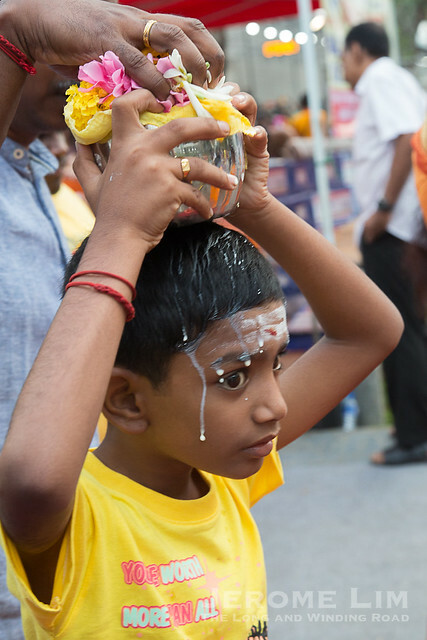 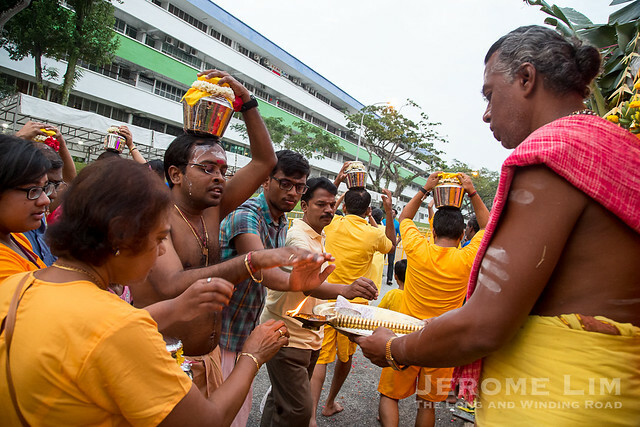 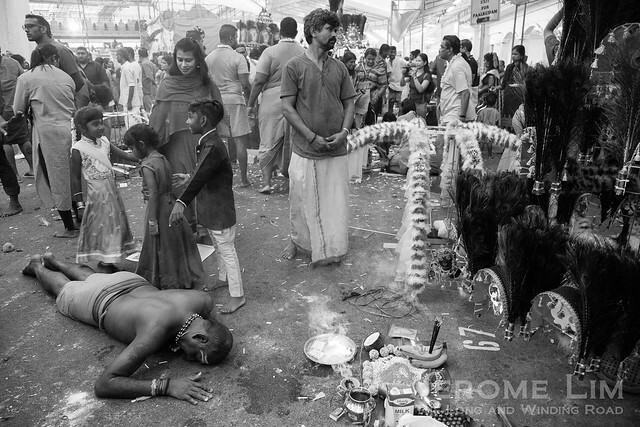 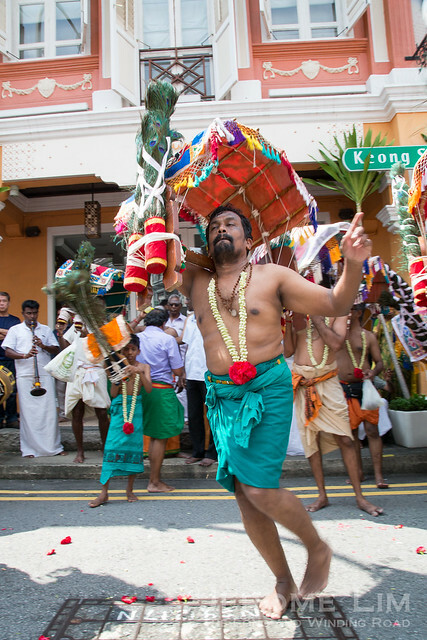 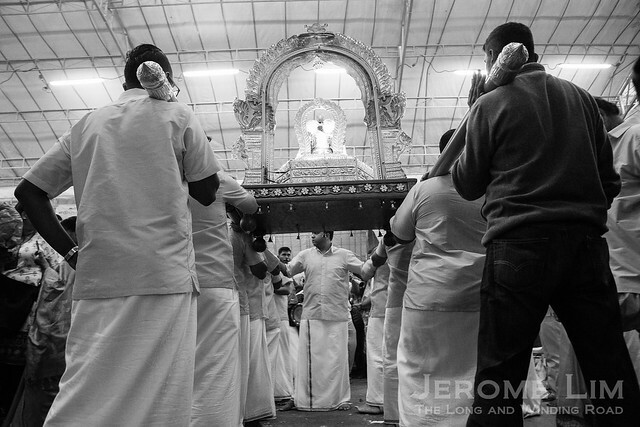 Involving the Chettiar community, “Chetty Pusam” is held as a prelude to the Hindu festival of Thaipusam. 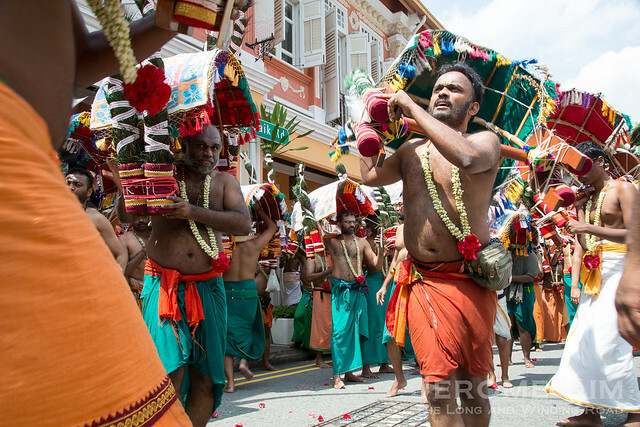 It sees an especially colourful procession of Chettiar kavidi bearers who carry the burden from the Sri Layan Sithi Vinayagar Temple on Keong Saik Road through some streets of Chinatown to the Sri Mariamman Temple and then the Central Business District before ending at the Sri Thendayuthapani Temple on Tank Road. 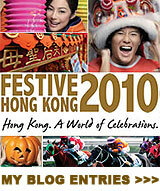 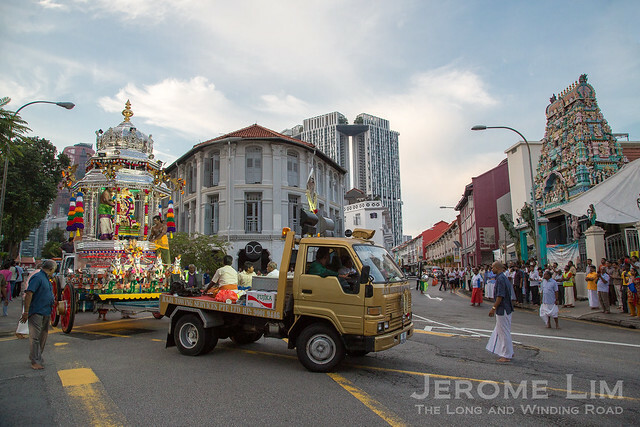 The procession coincides with the return leg of the Silver Chariot‘s journey. 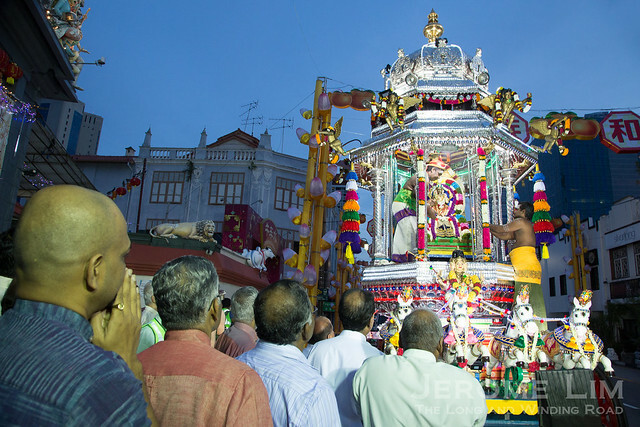 The chariot, bears Lord Murugan or Sri Thendayuthapani (in whose honour the festival of Thaipusam is held) to visit his brother Sri Vinayagar (or Ganesh) in the early morning of the eve of Thaipusam and makes its return in the same evening. 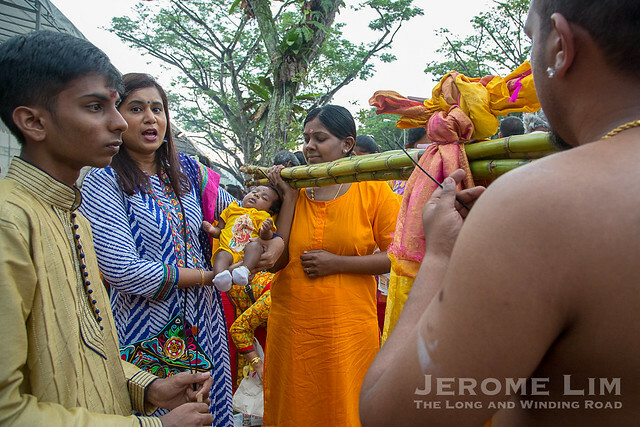 Besides being Good Friday, the 30 of March 2018 – being the day of the full moon – also saw several other religious festivals being celebrated. 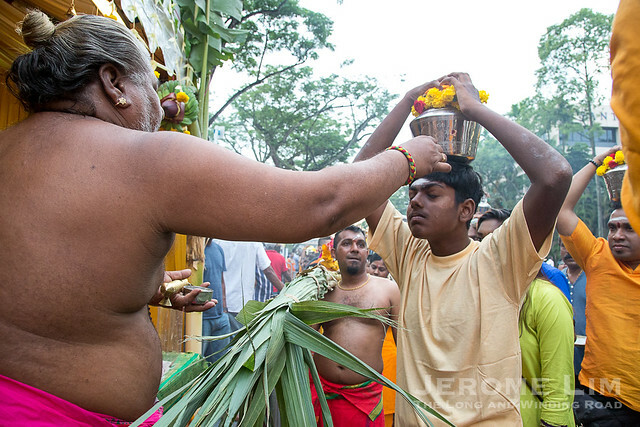 One, Panguni Uthiram, is celebrated by the Hindus on the full moon day of the Tamil month of Panguni. 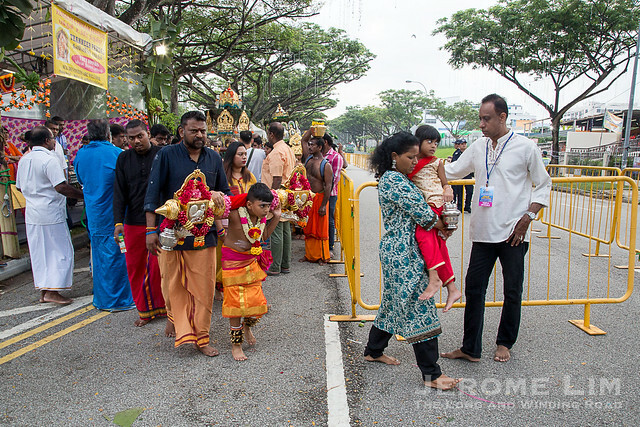 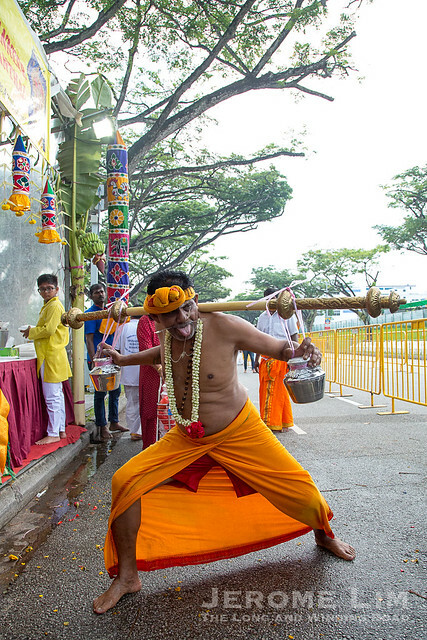 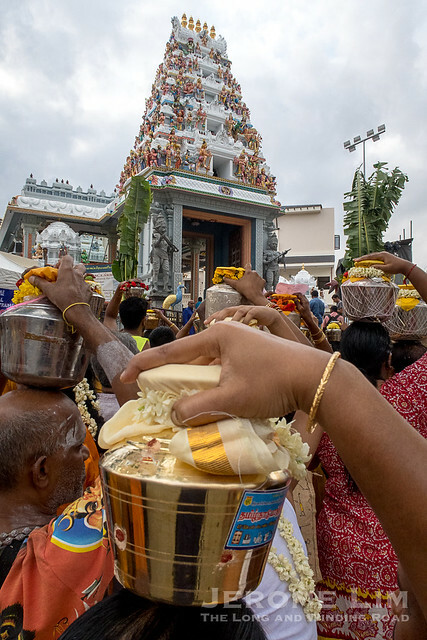 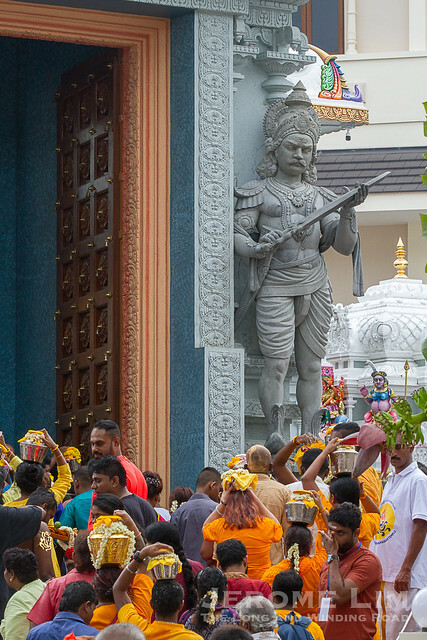 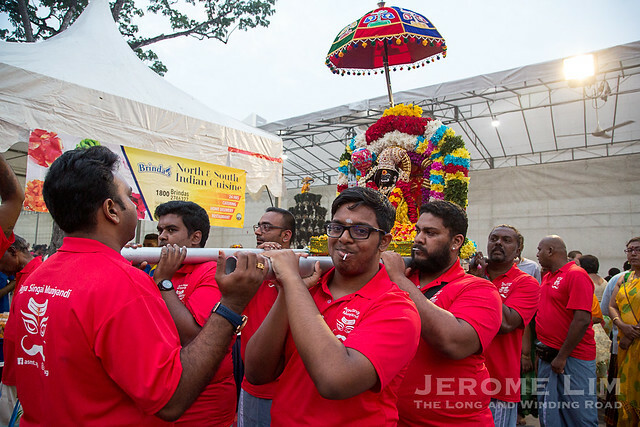 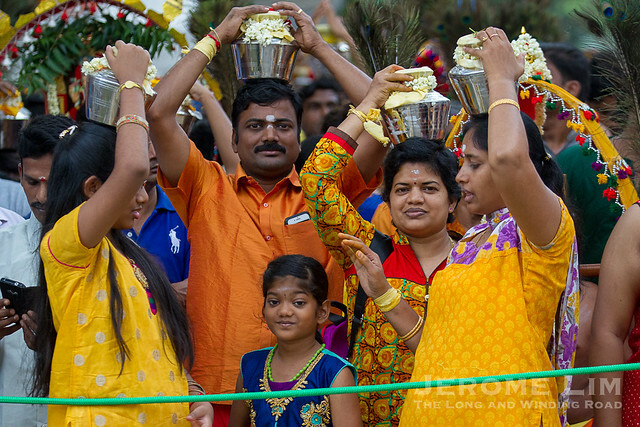 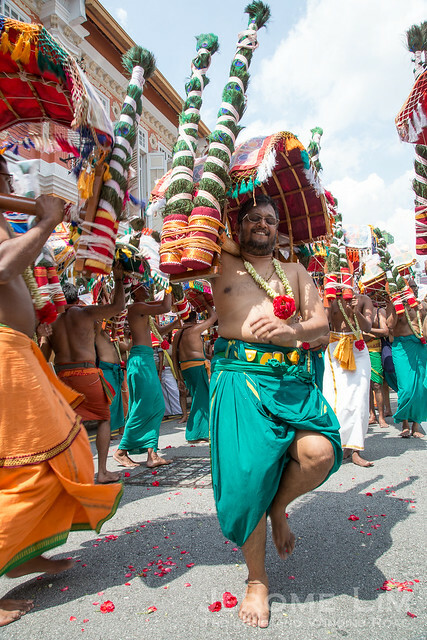 The celebration of the festival is an especially colourful one at the Holy Tree Sri Balasubramaniar Temple and involves a kavadi procession that goes back to the latter days of the Naval Base when the temple was located off Canberra Road. 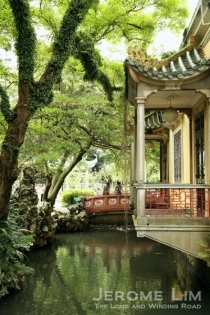 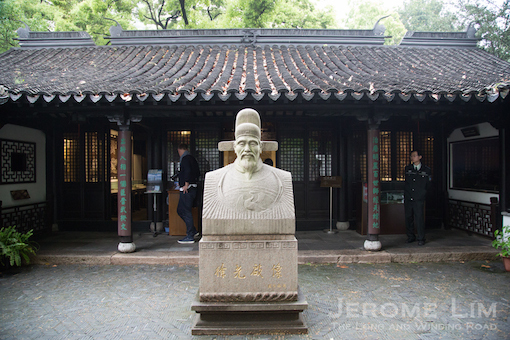 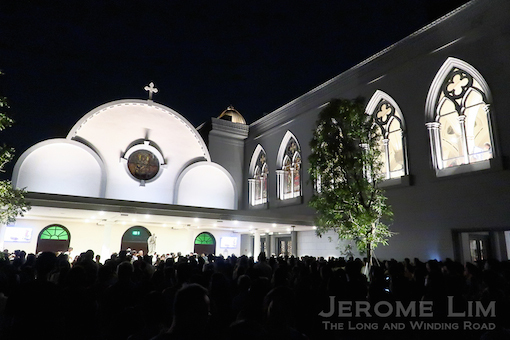 This year’s celebration was also of special significance – being the first to be held at its newly consecrated rebuilt temple building. 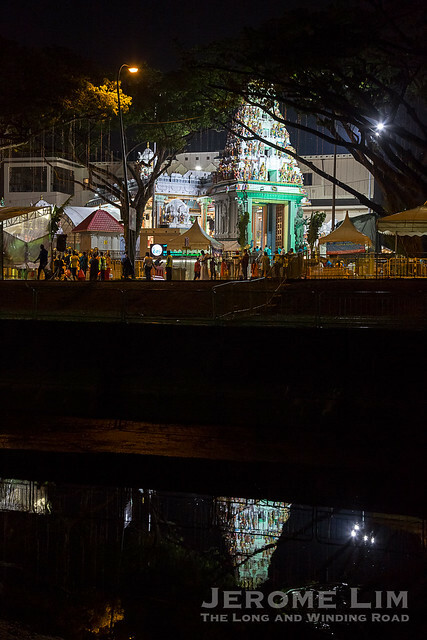 The rebuilt Holy Tree Balasubramaniar Temple. 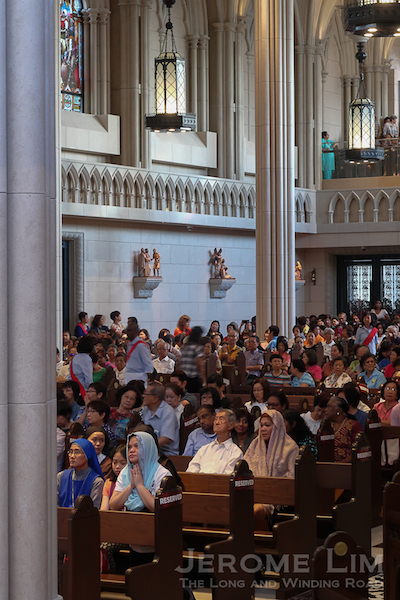 It was consecrated in February this year. 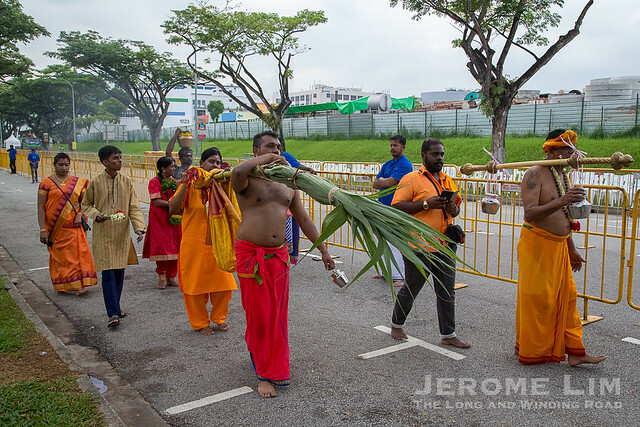 Seen at yesterday’s procession: a sugarcane kavadi. 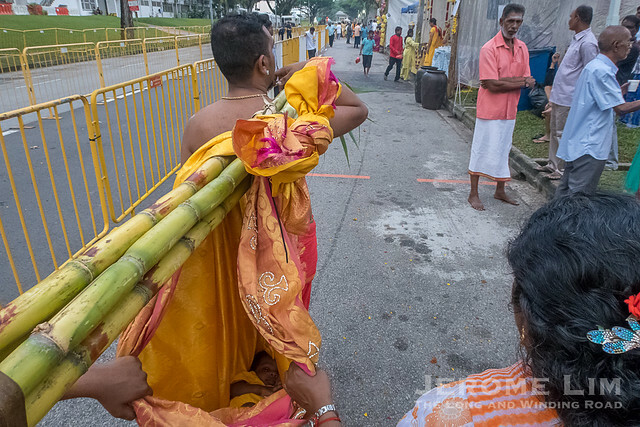 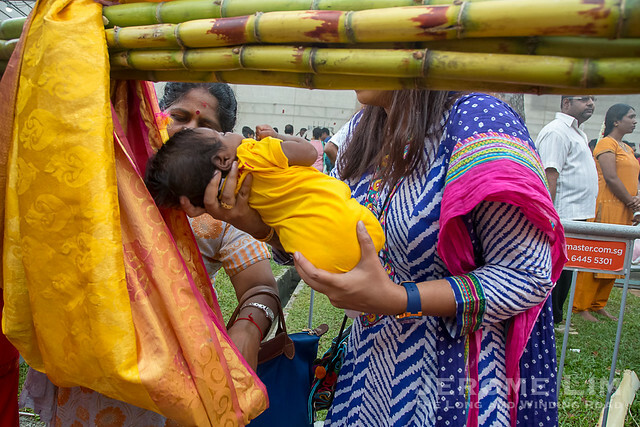 The kavadi is less commonly seen and is one with a baby slung from stalks of sugarcane that have been tied together, carried by the baby’s parents. 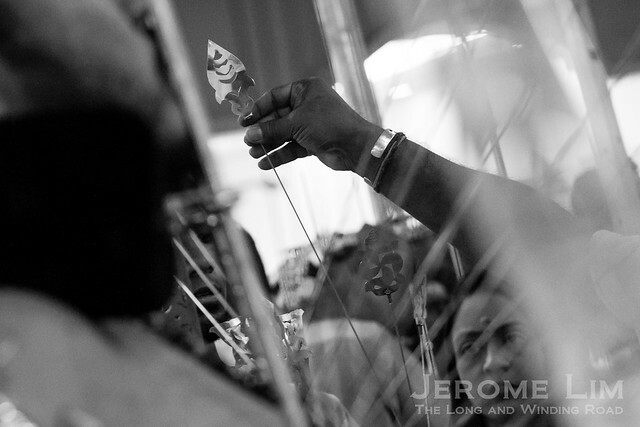 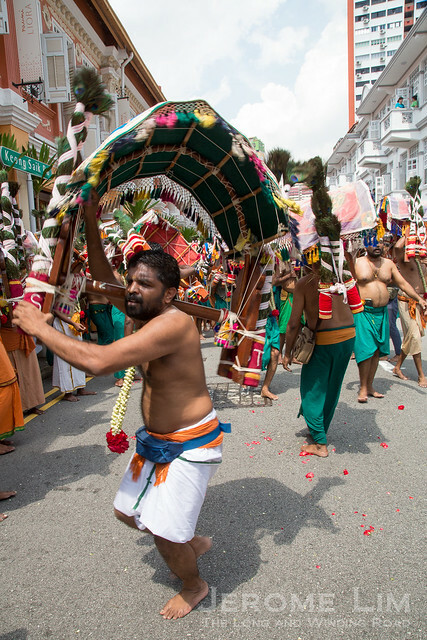 The kavadi is used by couples to offer gratitude to Lord Murugan for the blessing of a baby. 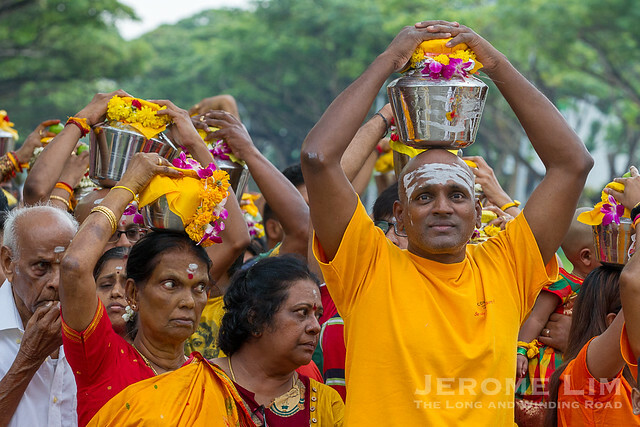 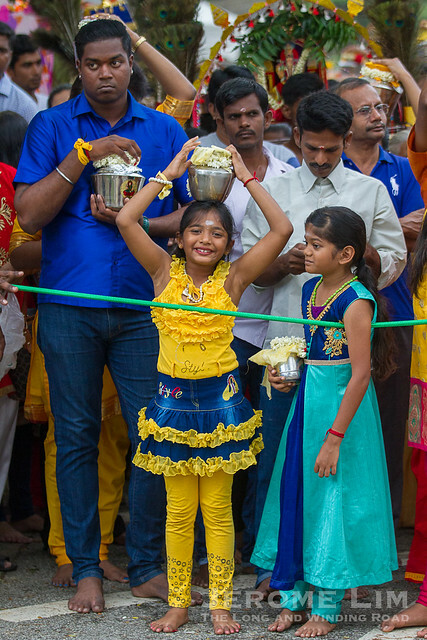 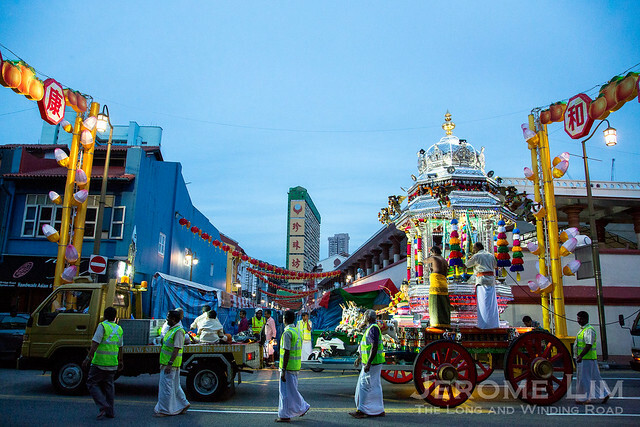 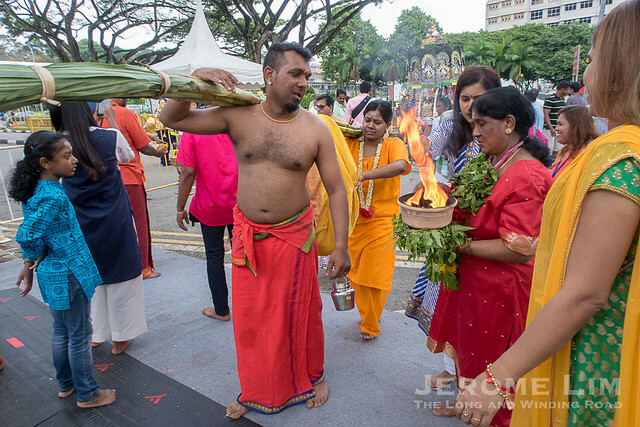 In photographs: the start of the colourful procession of Chettiar kavidis from the Sri Layan Sithi Vinayagar Temple on Keong Saik Road to the Sri Thendayuthapani Temple at Tank Road. 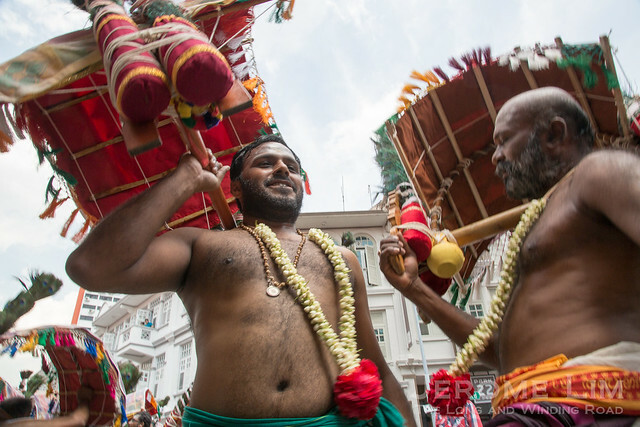 The procession, along with a Silver Chariot procession, is held every year as part of Chetty Pusam on the eve of the Hindu festival of Thaipusam. 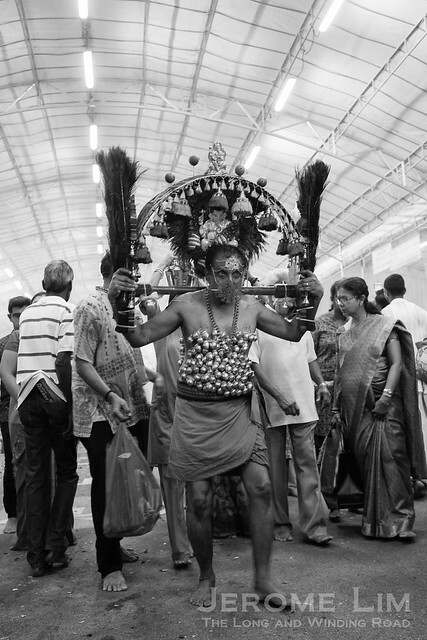 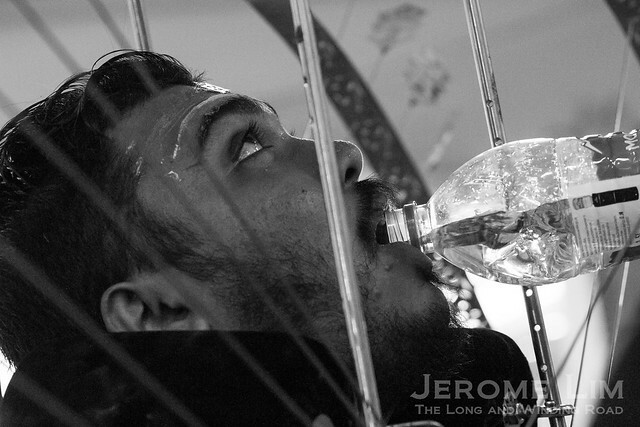 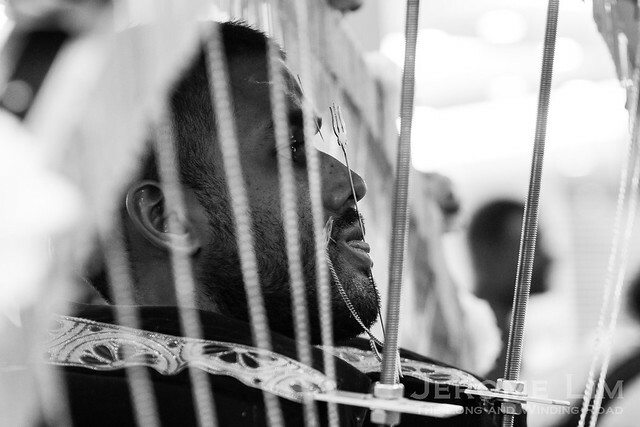 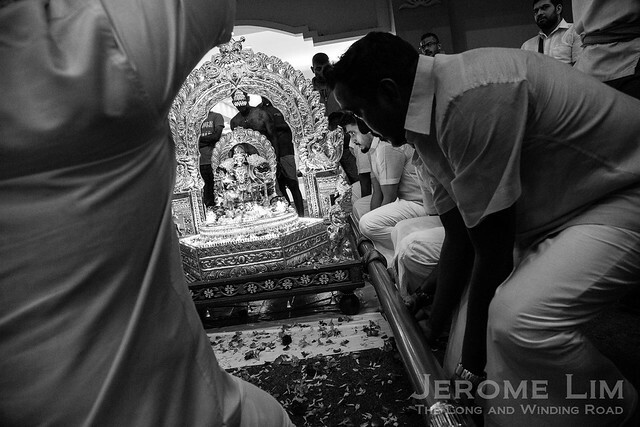 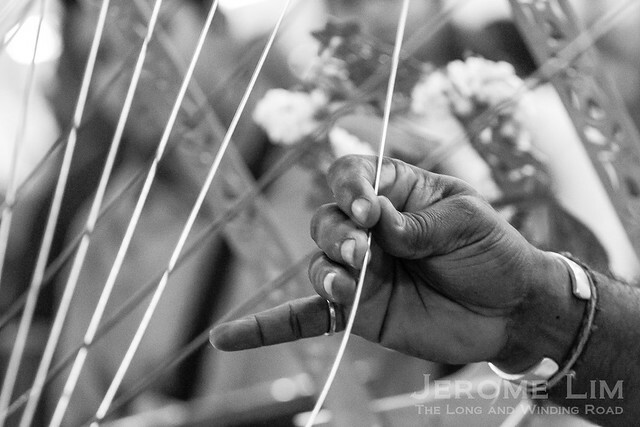 The eve of the Hindu festival of Thaipusam sees the Chetty Pusam Silver Chariot procession take place. 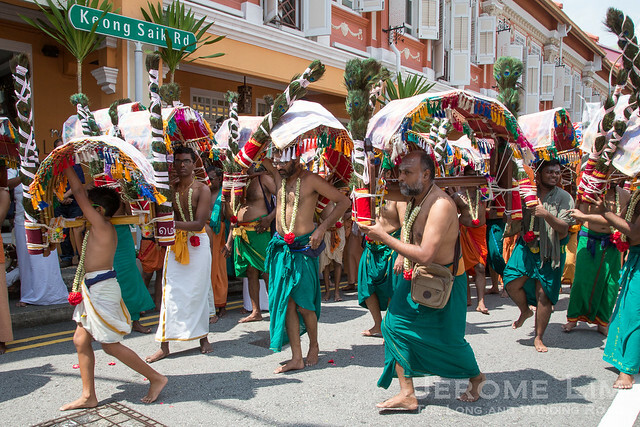 The procession is in two parts. 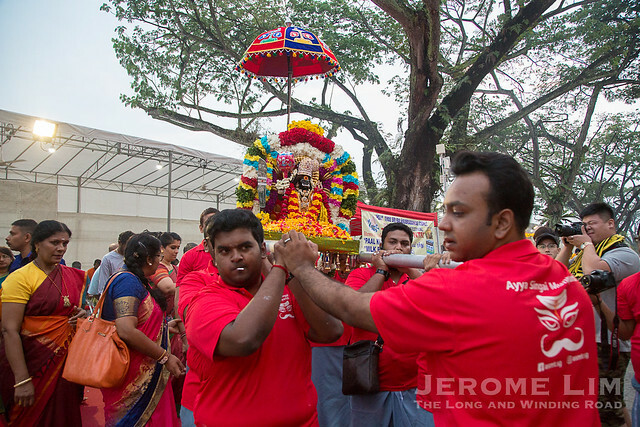 The first leg, which takes place in the early morning, sees Lord Murugan (also Sri Thendayuthapani) brought from the Sri Thendayuthapani Temple at Tank Road to the Sri Layan Sithi Vinayagar Temple at Keong Saik Road to spend the day with his brother Ganesh (Sri Vinayagar). 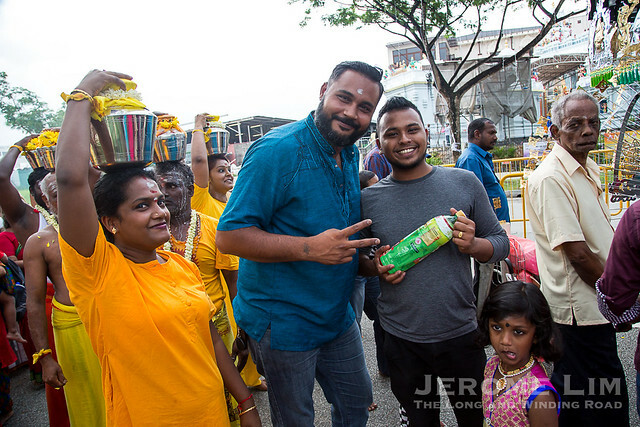 A stop is made along this leg at the Sri Mariamman Temple, which is dedicated to Lord Murugan’s and Lord Vinayagar’s mother, Sri Mariamman or Parvati. 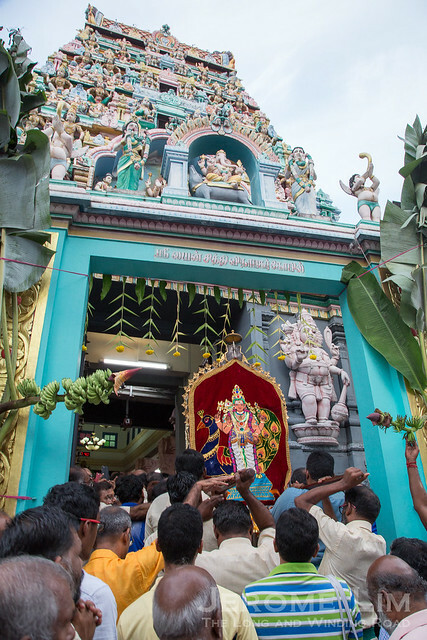 A second part leaves the Sri Layan Sithi Vinayagar Temple in the afternoon and makes its way back to the Sri Thendayuthapani Temple. 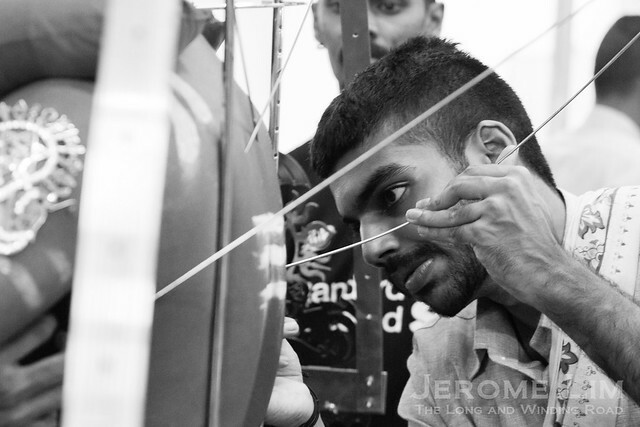 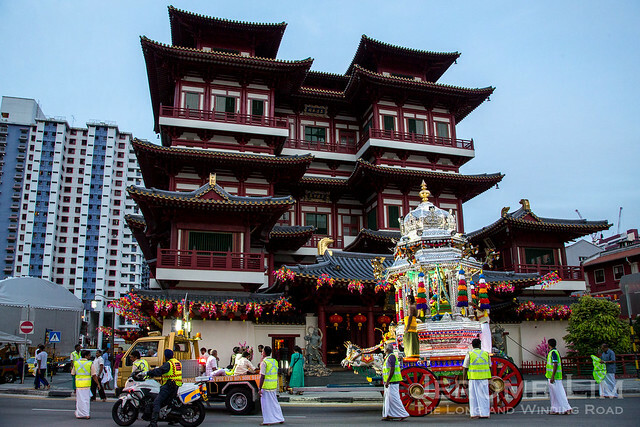 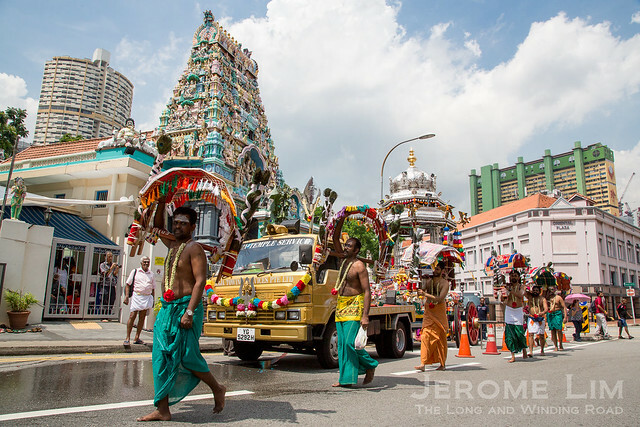 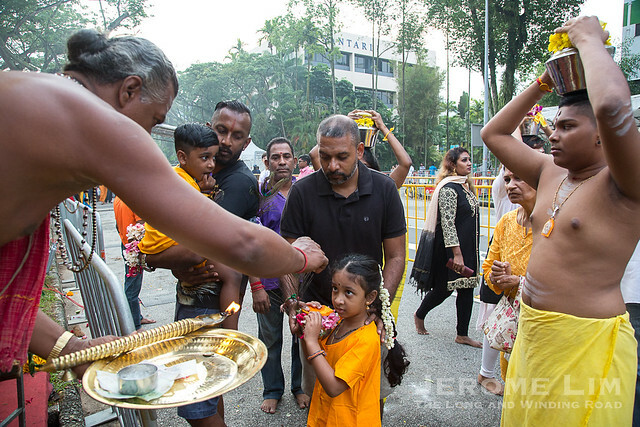 Due to the early start of the main Thaipusam kavadi procession (brought about by a lunar eclipse occurring just after sundown on Thaipusam), the chariot is scheduled to leave at about 2.30 pm this afternoon. 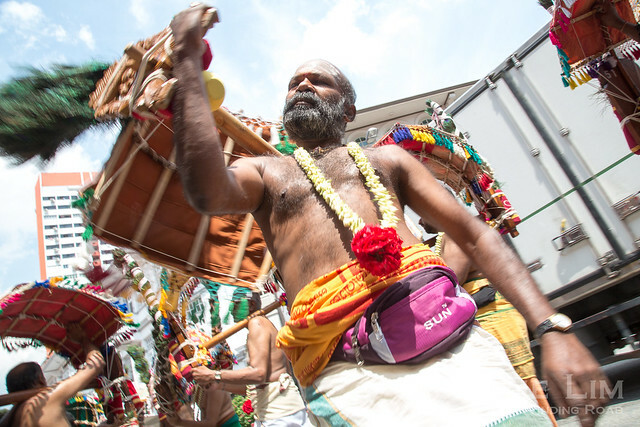 A procession of Chettiar kavadis will also leave the temple for Tank Road at about 1.30 pm. 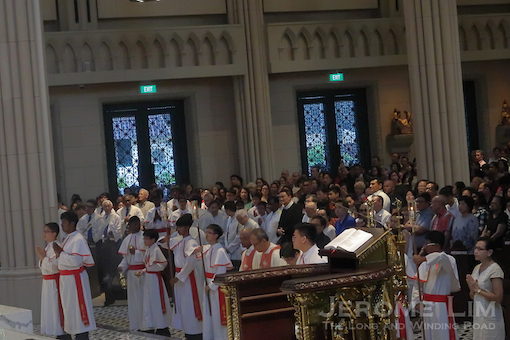 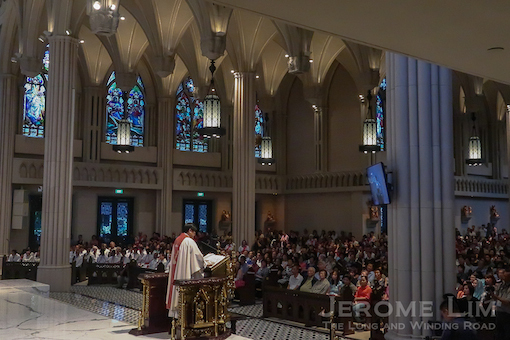 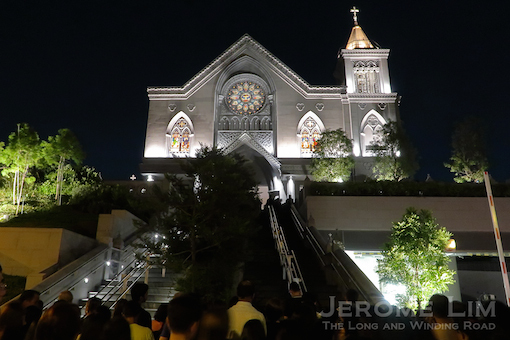 The long awaited reopening of Novena Church, after a three-year closure for the its impressive new church building, was greeted by a crowd of several thousands worshippers at its first mass celebrated at 6.30 pm yesterday. 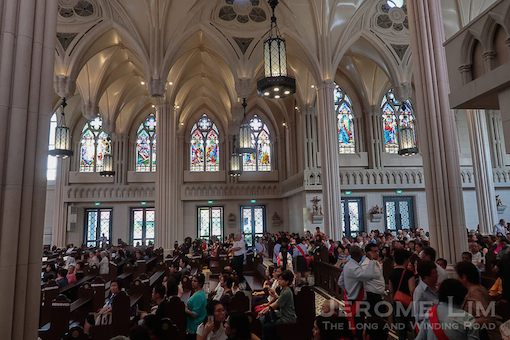 A queue to enter the church had formed some three hours before the church was due to open its at 4.30 pm and by 4.45 pm, the 1,500 seat capacity church was already filled. 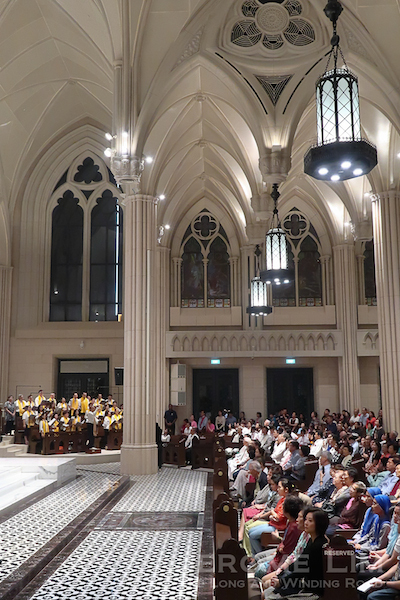 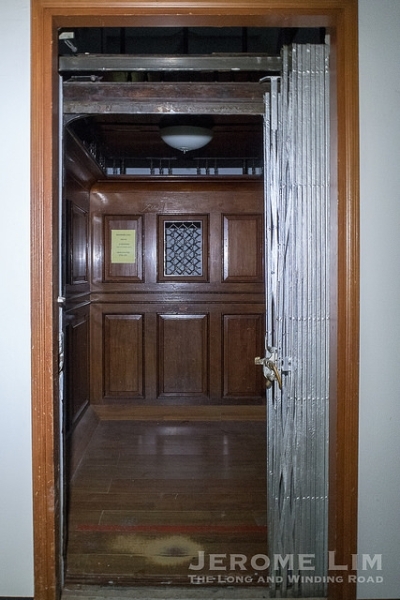 A glimpse at the insides of the new church. 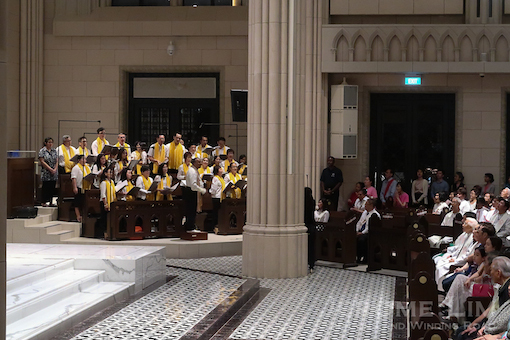 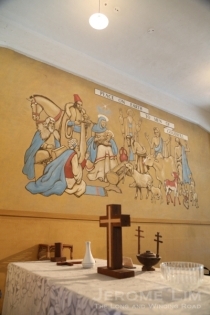 The celebration of the first mass at the church comes just over three years since the last mass was celebrated in the old church on 28 September 2014. 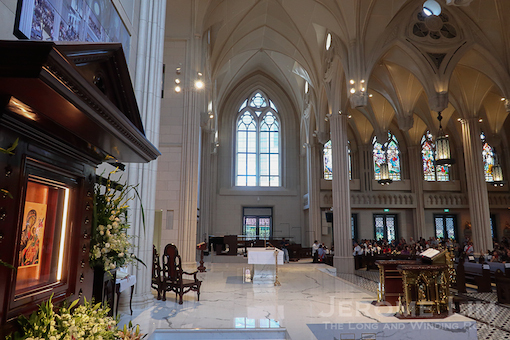 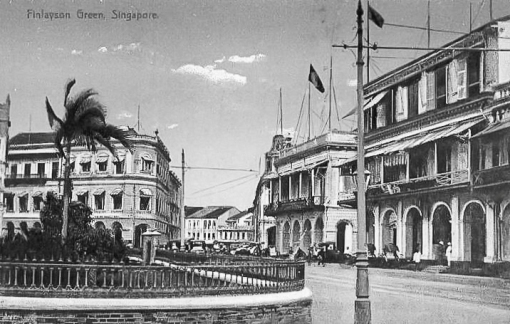 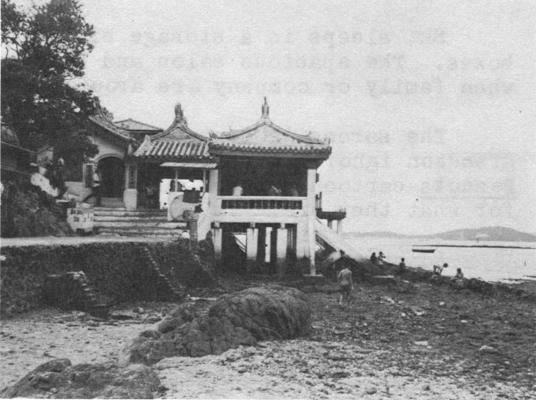 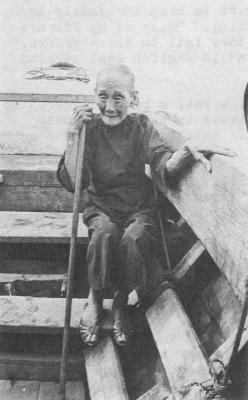 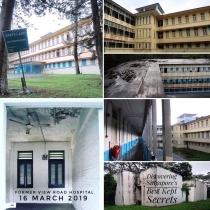 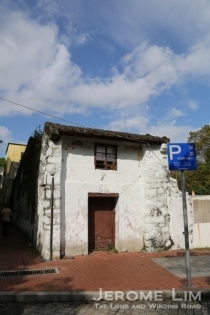 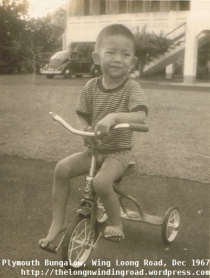 The old church was closed from October of that year with masses held at SJI Junior and Novena services held at the Church of the Risen Christ in Toa Payoh in the interim. 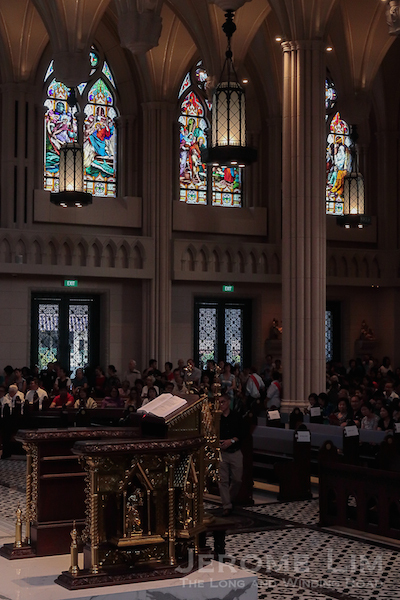 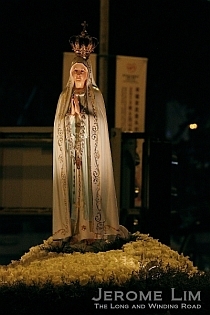 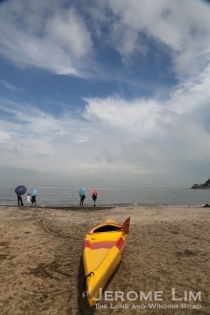 The popular Novena services, which have long coloured Saturdays along the stretch of Thomson Road at which the church is located, resumes today with and its first Sunday masses will be held tomorrow. 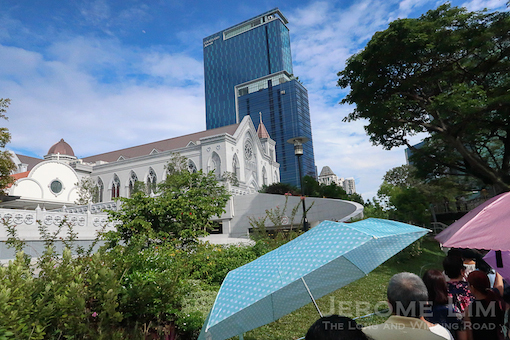 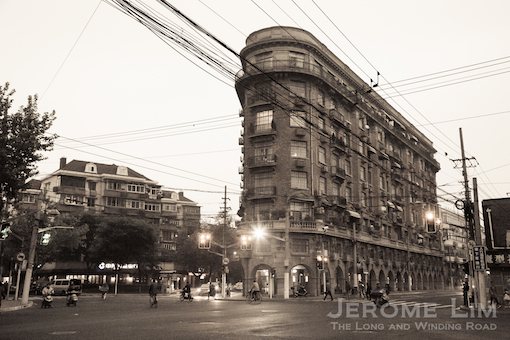 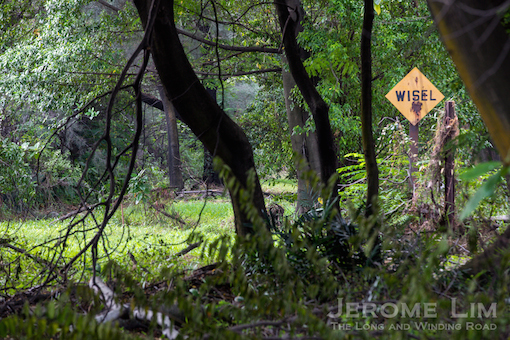 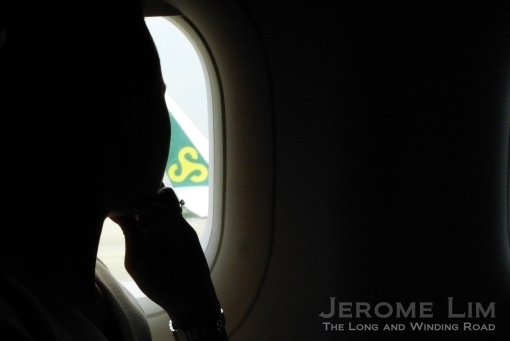 A first glimpse of the new next to the old. 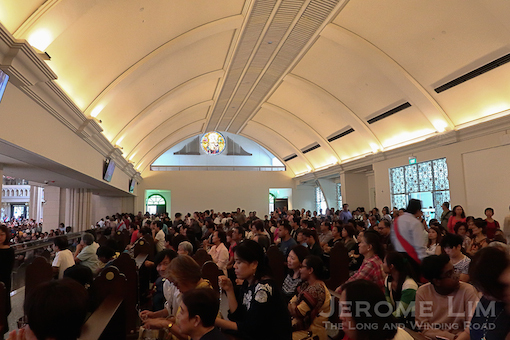 The 1500 seat capacity new church building was filled in a matter of minutes. 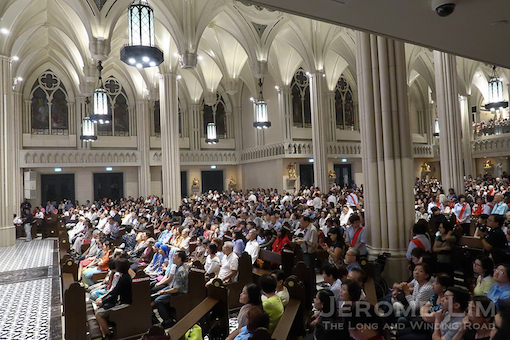 And within 15 minutes of opening, the old section of the church was also filled. 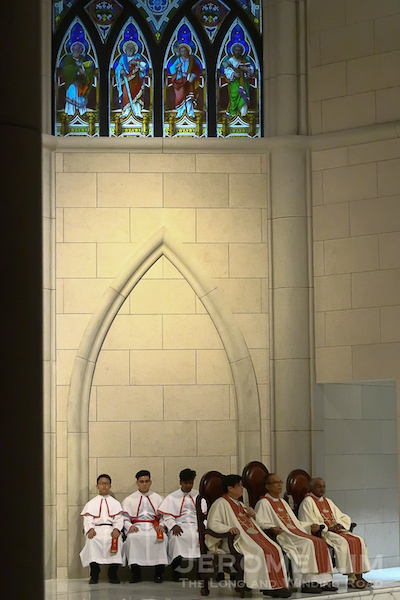 The new church’s first mass, dedicated to the Archangels, begins at 6.30 pm. 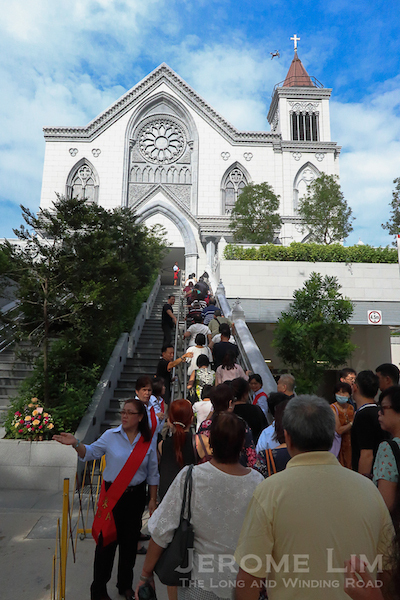 The crowd waiting to get in to see the new church.